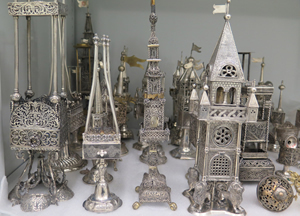 Yeshiva University Museum's collection includes more than 10,000 artifacts reflecting 5,000 years of Jewish culture, art, and history from around the world. Our collection features fine arts, folk arts, ethnographic and archaeological artifacts, clothing and textiles, ceremonial and ritual objects, manuscripts, books, and other documents. The Museum has preserved many rare objects and collections of Jewish art and material culture, including the 1478 recording of the Simon of Trent blood libel trial; Thomas Jefferson's handwritten letter of 1818 affirming religious freedom and denouncing anti-Semitism; the Torah scroll and Tefillin of the Baal Shem Tov (1700-1760), founder of the Hassidic movement; and clothing and accessories from around the world, including a gold embroidered Ottoman bindalli wedding dress, a Moroccan keswa el kbira (grand costume), and a kroj, a Czechoslovakian national costume made for a child in 1932/3. Spice containers. 19th-20th centuries. Silver. Collection of Yeshiva University Museum. Gift of Jewish Cultural Reconstruction and The Max Stern Collection.